Please Note: Discount at Mara’s Cafe & Bakery is not valid on whole pies or cake. Mara’s Cafe & Bakery is located in the heart of downtown Fanwood, just steps away from the historic Fanwood train station. Mara’s Cafe & Bakery satisfies any craving. They are open for breakfast, lunch and dinner and serve a full assortment of baked goods, as well as, gelato. The floor plan is wide open with plenty of space between tables, which makes it a great place for a lunch meeting, a meal with the kids or even telecommuting to work while sipping on some delicious coffee. They also offer outdoor seating during the warmer months and will soon be introducing a new dinner menu with wait service on the weekends. 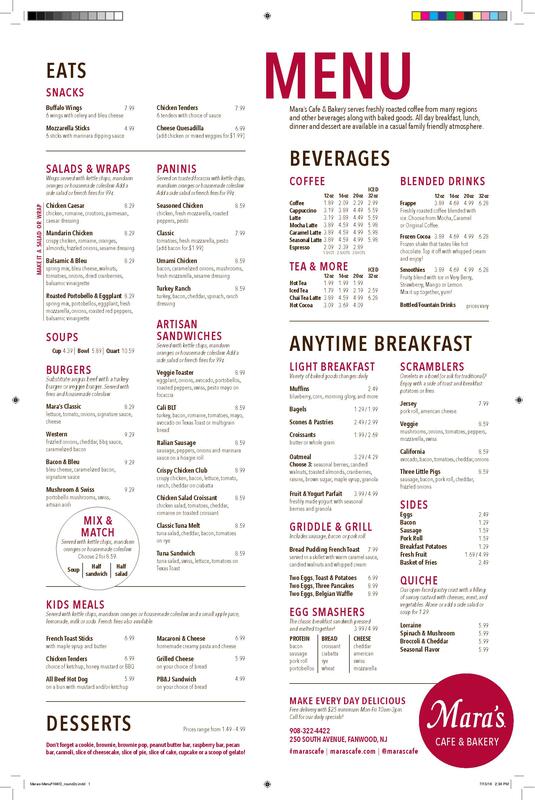 The dinner menu has great options like Shrimp & Grits, Chicken & Waffles, Hanger Steak and gourmet Burgers. What makes Mara’s Cafe & Bakery in Fanwood even more special? It is owned and operated by Inroads to Opportunities. Inroads is a 501c3 Non-for-Profit, that provides a real-world working environment for training, employment and life skill development for individuals with special needs. Stop in for a delicious meal and support an amazing cause.